Unban and I will play. So are you asking for a ban appeal? Well when I went through all the vetting and such you do to play on the server you warned me that I would probably get the boot. I really don't think I am a "PRO", well I know I am not a "PRO" if you look at my stats. I really wish I hadn't got banned the way I did by RAIF I wish I would have just been asked to leave and not just BOOM kicked off TS and out of server. I have good rounds and bad rounds just check my history but I really feel that to get better you have to play against better players. If I didn't do that with other things I do (ball, hockey even cards for that matter) I would not get any better. I think it applies to this game also. If I was in your server and players were complaining then so be it, say to me you know what maybe come back at another time and let players catch up in their gameplay. I have only ever been banned from 2 servers on here and I guess it upsets me that much that I am posting here. Just wish I was asked to leave and I certainly would have no problem. I respect what you have done with your community and you can run it as you like as you fit the bill. The people on TS were all very nice as were you when we spoke on there. I am rambling here lol. It just has bothered me I guess is all about the way it was done. Ban Appeals take place in our community meeting via a vote process in the TeamSpeak3 & that is commenced when a player returns to ask for a ban appeal. In the past we had decided that in order to get thru the appeal process takes a 100% vote by all the sr. admins & the members as well get a vote that must meet a minimum of at least 50% ( yes ) before a ban appeal is approved. We decided that the membership should have say & that's just a matter of respect towards all members & that's only right. Stats are also considered however they do NOT impact the appeal. So the question is DO YOU WANT TO INITIATE the appeal process? There will be a COMPUTER REPAIR CLASS tonight at 6pm cst. on HOW TO MAKE A user.cfg file & HOW TO EMPTY your ORIGIN CACHE! The schedule for this weekend is as follows: STAY WARM / STAY WARM / STAY WARM / Community Meeting Sunday / PLAY SOME BATTLEFIELD!
" KILLEM & CHILLLEM RoCkS "
I forgot to mention that there is NO KILL CAM! Still love giving this out to players .. so helpful!! We usually have between 5 & 10 new players join over the weekends & then thru the week sometimes we get a few. Once they give the TeamSpeak3 a chance & are shown how to utilize it & set it up correctly & explained the security they always return & we have even had some bring in friends whom have returned. It's like a huge circle that never ends & all the comments made are very positive. We appreciate what is said & even more so those whom are willing to join & learn, it's pretty awesome! Tickets vary based upon the number of players in server... Sooo, Average tickets per map mode usually 800 - 1200. During the Week - tickets may be reduced if not a ton of players to facilitate many map opportunities. In the #1 Server - We play 8 DIFFERENT MAP MODES over 34 Different maps!!! Not just the usual 5 map rotation that many servers do. #2 Server - All the Conquest Large Vehicle maps!! Vehicle maps ONLY ! #3 Server - All the Run & Gun maps- 7 DIFFERENT map MODES!! No Vehicles! 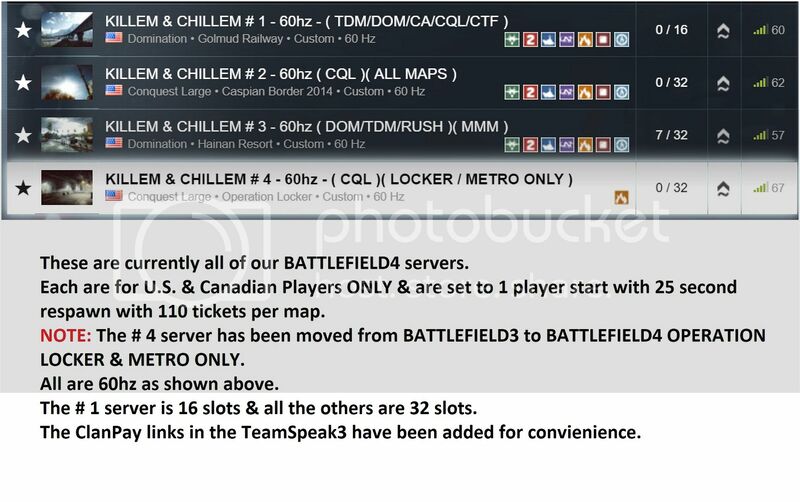 #4 Server - Conquest Large - LOCKER and METRO ONLY!! Don't forget 1 player start!!! Need to practice flying?? Boats? Tanks? Come check us out!!! This is a group dedicated to having fun! If you need to stat pad or conquer the world go elsewhere - love the game ? Love to play? Come On BY!! All the above mentioned items is what it takes to make things better for everyone! i heard rumors that their is even a computer help area ? Not ONLY do we have a computer channel... we have CLASSES to help guys tune their computers for better game play!! I have scheduled a COMPUTER REPAIR / SETTINGS class for this evening 2/24/19 @ 7:00 pm cst., You must be present in the TeamSpeak3 in order to participate. If you don't have TeamSpeak3 the GUIDE is shown below in my signature & it provides all the connection information within the pictures, To view the pictures easily simply left click on them! Recently I have completed further testing in regard to the Origin Application & the draw consumption by various applications ie. ProCon / TeamSpeak3 / Discord /Skype / FireFox / Edge /Chrome & have discover various variables in regard to those applications. Without further comment I will share the results in the TeamSpeak3 possibly Saturday morning so all members are aware. I didn't want to set a specific time to do this as I'm certain there will be numerous questions of which I will attempt to answer. I will however say that this is something each of you will want to know. If you can't make it Saturday morning I will attempt to also hold a Sunday meeting as well, probably after our 10:00am cst Community meeting both days but I'm not certain so be sure to follow this forum post for further details! Also I'm not 100% certain as of yet but the # 4 Raffle could possibly be held this Saturday ( IF ) further tickets are purchased, we shall see! Hey there, try and cool it down a bit with the bumping. There's no real need to bump this as often as it is, once or twice a week is fine, but every other day is getting close to spam. Every other day is twice a week & our members constantly read & follow the post made. It's only spam if no one reads what's there, they're simply often not so good about leaving comments! I usually post 2 times a week & sometimes 3 depending on the need. Thanks for the heads up! blows my mind that after all the warnings on discord, we have a guy who got hacked!!! thru discord!! not loading that on my rig! !